Paddleboarding has many different sub-disciplines; surf, touring, river running, all-round paddling and even fishing. Its all inclusive nature sees everybody taking to the water, from experienced big wave surfers and racers, to adventerous weekend paddlers and families on a day at the beach. No matter where you paddle and what your level of experience, one element must be considered by everybody; safety. Here we will focus on the equipment that is designed to make every paddle you go on as safe as possible, whilst not getting in the way of your fun on the water! Why wear a leash? You wouldn't drive a car without wearing a seatbelt, and the leash is the same for paddleboarding. The leash is your fundamental connection to your SUP. Wherever you paddle, wind, tide, currents and water flow can be at play. Even if the water looks calm when you start your paddle, conditions can change and tides can turn. Without wearing a leash, should you fall in being separated from your board is a real possibility. The wind and current or tide can act differently on your body, which is largely under the water, to the lighter weight SUP which is sitting on it. The SUP may drift away faster than you're able to swim after it, especially if there is an element of shock after falling in unexpectedly. The leash is the lifeline that attaches you to the largest flotation device available to you; your paddleboard. For use when all-round paddling, touring, river running. The coiled nature of the leash keeps it from dragging in the water which minimises the risk of it getting snagged on any obstacles, or hidden underwater hazards. For SUP surfing. A long (8-10ft) straight leash provides a strong connection yet puts more distance between yourself and the board in a surf environment when falling off and tumbling in a wave is highly likely. Normally leashes are worn around the ankle or calf, but the quick release waist leash is recommended in certain situations. When white water river running, for example, the waist leash stays well clear of the water to avoid snagging on rocks, plus can be quickly and easily released if necessary should it get caught and put you in a dangerous situation. A SUP Inflatables coiled leash is included for Free with all SUP board purchases. Coiled and straight leashes are also available to buy individually. The leash is worn to ensure the paddleboard stays with you at all times, the board itself acting as a flotation platform should you get into trouble. The temptation then is not to consider wearing any other safety equipment. However, the leash should not be solely relied upon, when the consequences of getting into trouble can be so severe. You should always check the your leash, leash attachment rope and your SUP's D-ring are in good condition before each paddle. That said, failure of one of these items could see you separated from your SUP. Should your leash become snagged on an obstacle, you may need to temporarily release it. For SUP Yoga wearing a leash may not be practical, where full range of movement for the more adventurous poses may be required. Beach fun with the family may involve sharing a paddleboard, meaning that not everybody is attached to the board via a leash. 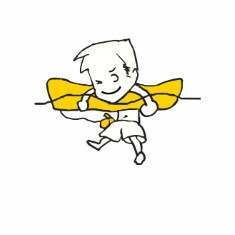 Why wear a buoyancy aid? Buoyancy aids provide personal flotation, which is highly important should you become separated from your board or incapacitated in any way. They may include a whistle for attracting attention. Some models include a pocket which can be useful for carrying items such as a mobile phone in a dry bag. It is important to wear a buoyancy aid that fits you well, so that it provides adequate flotation and doesn't ride up over your head. If you're looking for something with ton more style than a traditional buoyancy aid, check out these new Baltic gilet-style reversible buoyancy aids! We have a range of buoyancy aids suitable for paddleboarding in stock. It has been recognised that paddlers are not always choosing to wear a traditional buoyancy aid, perhaps due to the reduced freedom of movement that they can cause, so innovative manufacturers have developed a new line of personal flotation devices with active water users in mind. 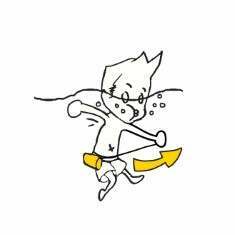 These products offer buoyancy in emergency situations whilst being small and discreet, retaining the water user's full range of movement and sense of freedom. 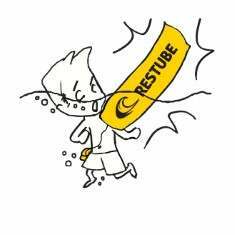 The Restube is the PFD that we recommend. It's compact size makes it easy and comfortable to wear paddleboarding and it gives the user confidence from knowing that it is well engineered and tested piece of safety equipment. 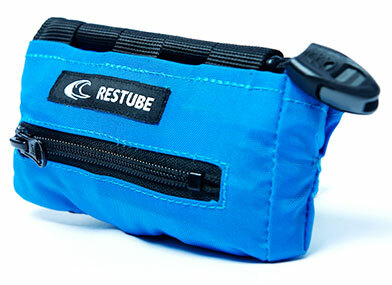 The Restube is highly compact and can be worn either horizontally or vertically around the waist. It doesn't restrict range of movement. Should you require, pulling a tab automatically inflates the Restube thanks to a small C02 canister. The floating bag allows you to rest, on the surface of the water, without expending valuable energy. A valuable piece of personal safety equipment for all watersports. Pull the trigger as soon as you want the Restube to inflate. Holding the inflated buoy keeps you at the surface, giving you rest and time. The Restube is used and recommended by the SUP Inflatables team. We wish you a safe and enjoyable time on the water. If you have any questions about paddleboarding, SUP safety, or what SUP safety equipment you should go for, please feel free to get in touch.